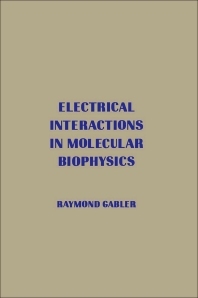 Electrical Interactions in Molecular Biophysics: An Introduction deals with electrical interactions between biomolecules and therefore encompasses two disciplines, molecular biology and physics. The emphasis is on the electrical nature of biochemical or molecular biological reactions. The principles of electrostatics are used to explain some of the basic units of structure on a molecular level. Comprised of nine chapters, this book opens with an overview of the concepts and structures of biochemistry, with particular reference to different structural biochemical groups and how they are used as building blocks in forming molecules. The following chapters discuss the basics of elementary electrostatics; dielectric constants and dipoles; the dipole moments of biomolecules; van der Waals forces; and Debye-Huckel theory. Water and water structure are also considered from a physical standpoint. The final chapter is devoted to experimental techniques that rely upon the electrical properties of biomolecules and explains what types of information can be obtained from each experimental form. This monograph will be of interest to students and practitioners in biochemistry, molecular biology, biophysics, or microbiology.